What would you rate my application? 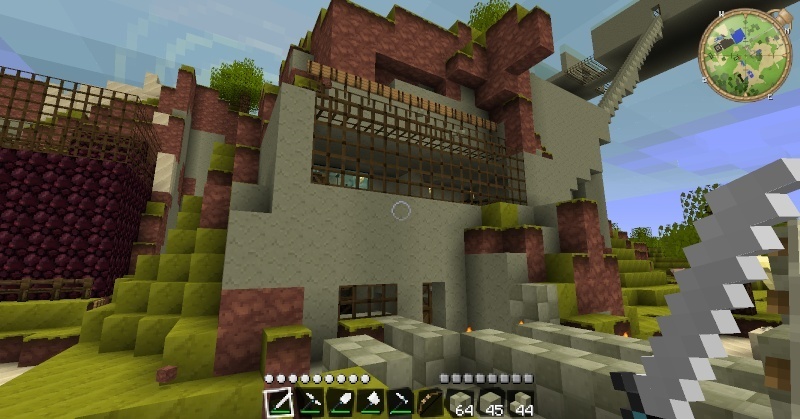 I don't have too much experience outside of the Minecraft-ity server, but when I first started playing Minecraft Beta (around 1.2), I hosted a server for my friends and me to play. After hastily tunneling out a mountain for a shelter, I started work on a simple minecart system. 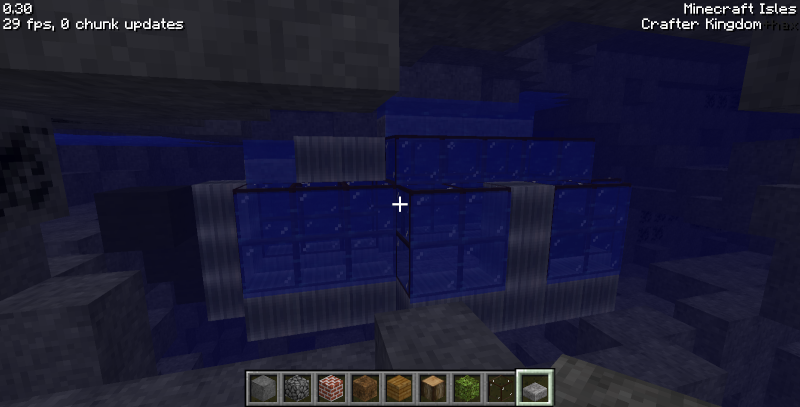 It was rather simple; a 1x8x1 channel of flowing water pushed minecarts slowly (no longer works), which were then boosted once they left the water channel. 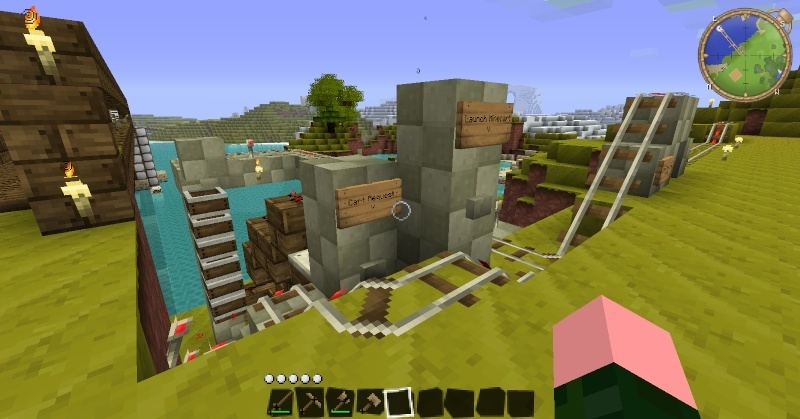 I also built another minecart launcher that boosted minecarts for hundreds of blocks (until it was fixed in Beta 1.6). 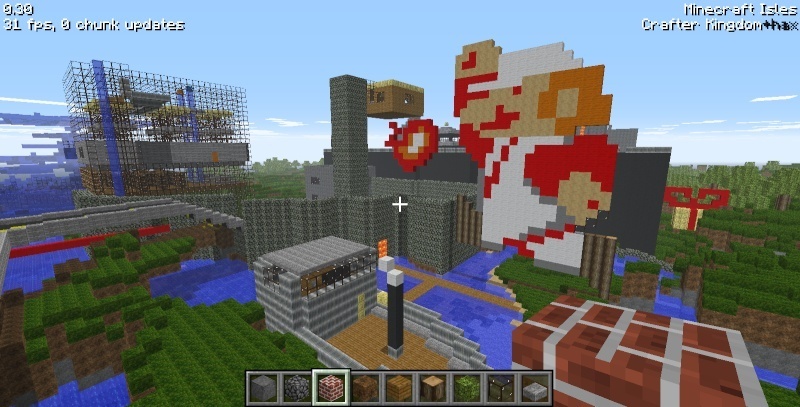 In addition, I play a Minecraft Classic server, where I built a tower, modern-looking bridge, an incomplete apartment building, a subway station, a steamboat, a Spleef arean, and a pixel art image of Fire Mario from the NES Super Mario Bros. 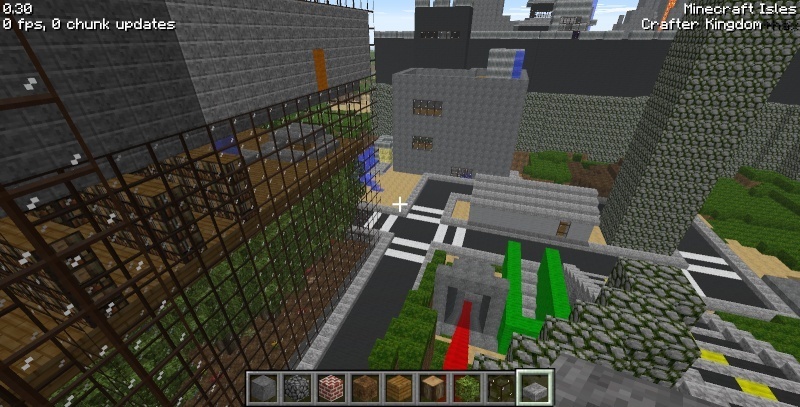 While I don't have too much experience in Minecraft architecture, I have several experiences on Minecraft-ity. 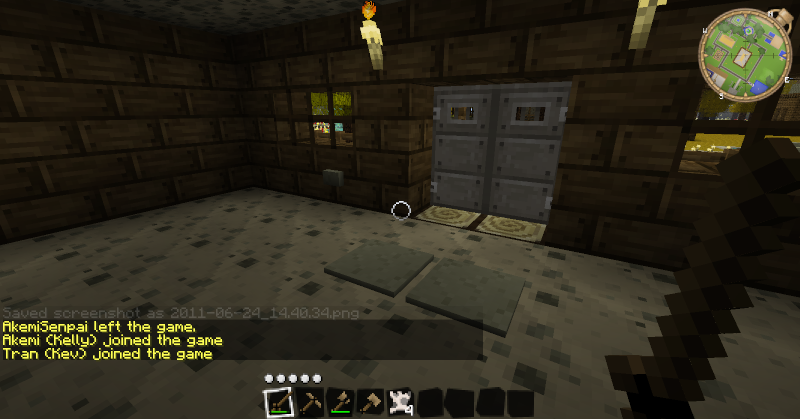 On the server, my house has iron double doors which are opened using buttons and a pulse lengthener. I have also constructed a minecart station that features a pez dispenser powered with a monostable circuit. Next to the station is a drawbridge that leads to an underwater base that I mainly constructed. 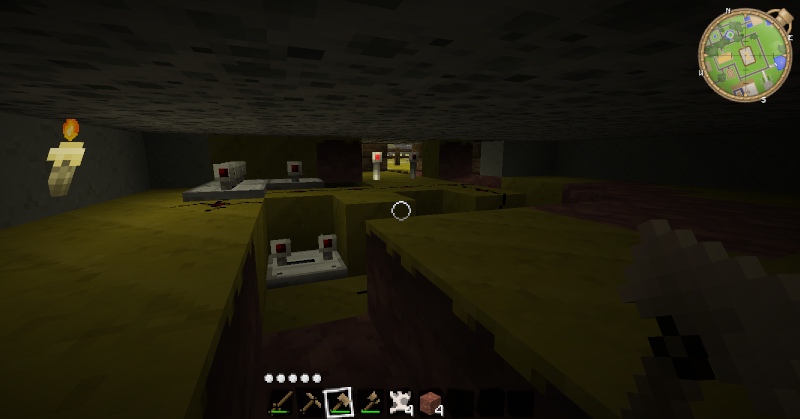 In the underwater base, there is a mob trap. 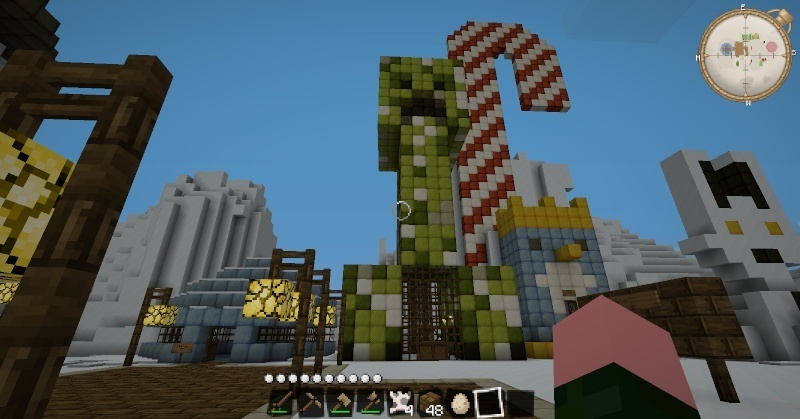 Last but not least, I constructed a Creeper statue in a snowy settlement. The Creeper statue also functions as a home. I don't have a lot of great examples, but here's what I got. A hastily built shelter in a mountain when I played SMP (and MC) for the first time. It was later expanded to have that second floor observatory. 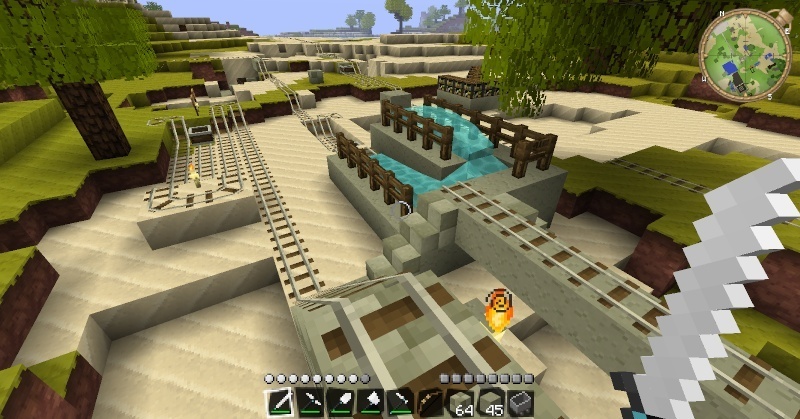 Old minecart stations on my (no longer active) SMP server. The one on the right used water to push minecarts, while the one on the left was just a quadruple booster (neither work as of Beta 1.6). 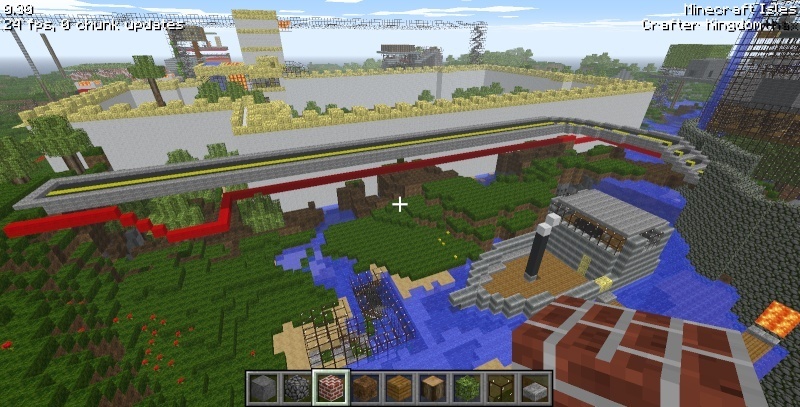 New minecart station on Minecraft-ity's server. From this angle, one can see the pez dispenser which holds all the minecarts, the button to call a minecart, and the button to launch a minecart once it's been called. 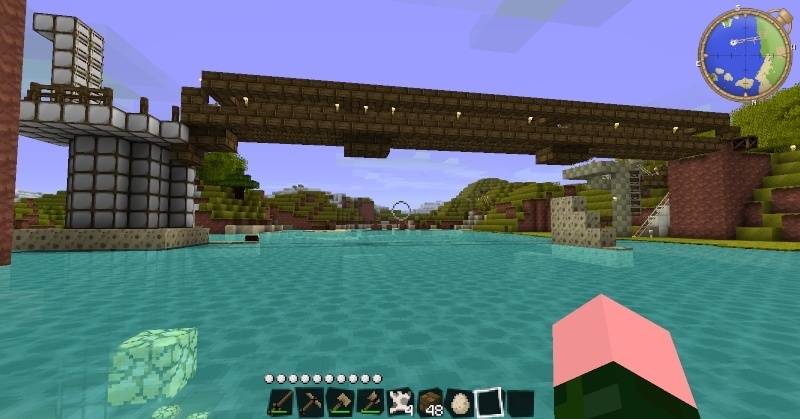 One can also see the edge of the drawbridge I constructed. 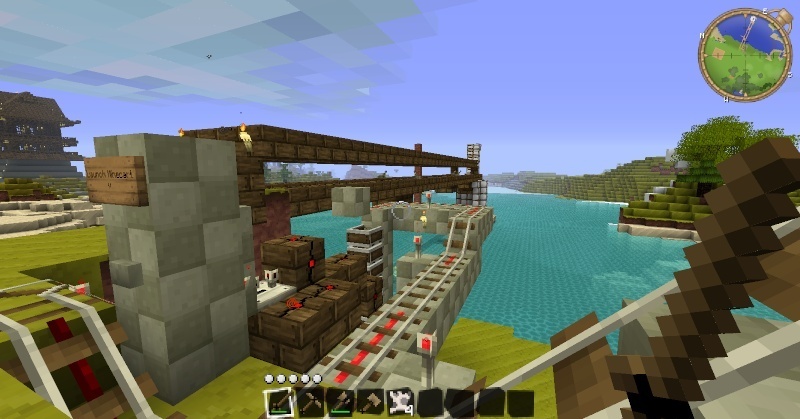 Same minecart station, except you can see more of the monostable circuit that connects with the pez dispenser. You can also see more of my drawbridge. 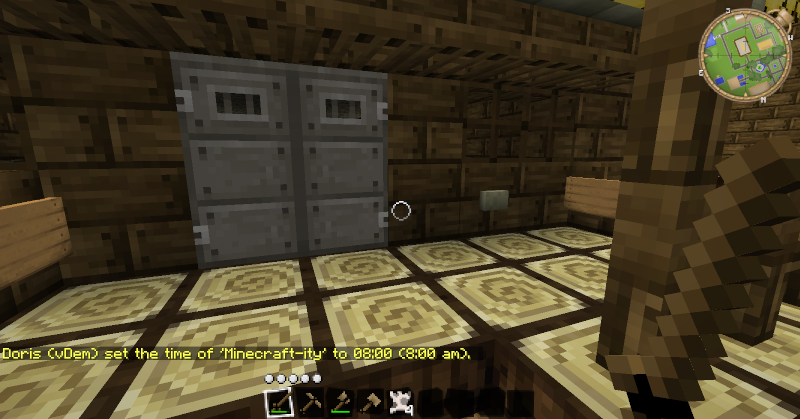 Iron doors in the front of my house on the Minecraft-ity server. The doors stay open for ~5 seconds when you hit the button nearby. Ditto, as viewed from inside my house. The doors can be opened from the inside by either pressure plates (which opens the doors for about 2 seconds) or a button (which opens the doors for about 5 seconds). 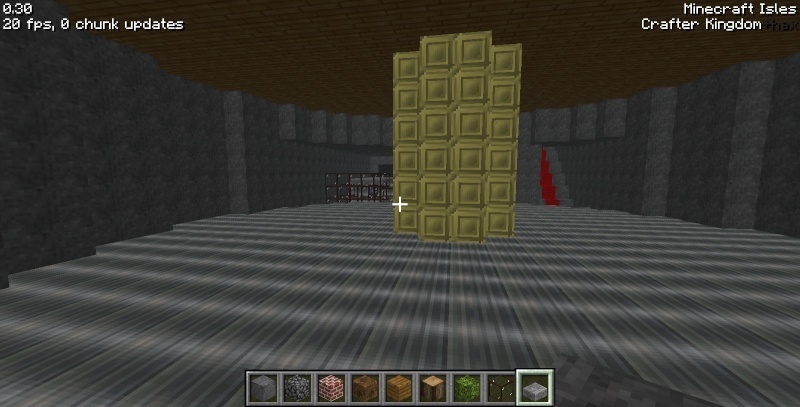 Redstone wiring of the iron double doors. The pressure plates are connected to the doors by a simple double door circuit. An added pulse lengthener connects the buttons to the main circuit. Side view of my drawbridge in the MC-ity server. To the left is the entrance to my underwater base. My underwater base as seen from above water. It is possible to enter and exit the base through the ceiling. Ditto, as viewed from inside the base. The ladder can be climbed to exit the base through the ceiling. My Creeper statue in a snowy settlement on MC-ity's server. It also doubles as a home. The Creeper is meant to have its head tilted sideways. A view of my portal house, my unfinished apartment building, my Spleef arena, my tower, red wool in a tunnel (which act as train tracks in the MCForge mod) and the entrance to my subway station. Interior of my subway station. A submarine I made underwater and underground. I want to support the community by making players want to stay and continue playing this server. To be honest, at first I wasn't entirely sure exactly how I wanted to help the server. I could apply for a Helper to assist players with their problems and make them feel truly welcome, become a Architect to provide the community with outstanding buildings and recreation and assist others in their buildings, or become a Forum Moderator to keep the forums neat, tidy, and appealing to new players. In the end, I thought that Architect would be the best option because out of the three choices I had, building things and maintaining the landscape appealed the most to me. While I may not be the best builder on the block, I am more than willing to help the community by attracting more people's attention toward the server through architecture and landscaping. I will try my hardest to get a piece of architecture done, although occasionally I procrastinate and become lazy. I am a mostly active player on the Minecraft-ity server, and I will be on most of the time the server is up. As a person, I tend to be blunt, usually straightfoward, a little bit lax, and easygoing a lot of the time. Usually a lot of things are fine with me, unless it feels wrong or a lot different, which is when my gut feeling just kicks in. I accept constructive criticism from others, as it helps me to improve whatever I'm doing. I usually try to be on friendly terms with other beings unless they're doing something that I think is blatantly wrong, even though the Project-ITY community is arguably one of the best I've met; many people are friendly and helpful, and in addition to helping the community, I want to return the favor. I feel that redstone circuitry is one of my specialties. Even though I'm still learning, I can create some basic redstone circuits, including those shown in my examples. As I continue to learn redstone circuits, expect to see more complicated circuits from me. 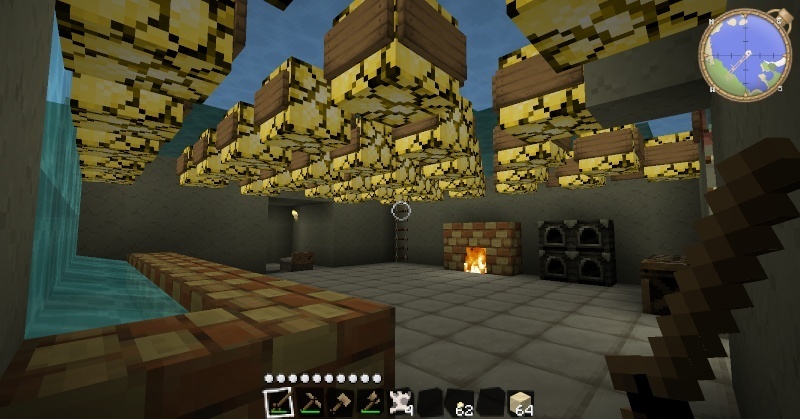 Btw how did you make the ceiling on your underwater base so that he water didnt fall down? 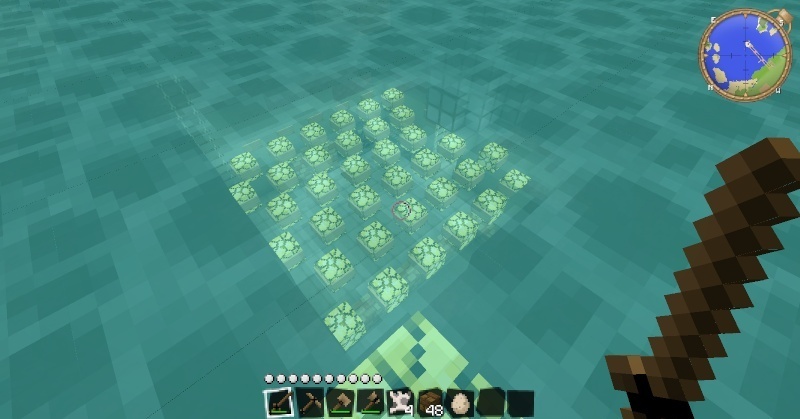 Btw how did you make the ceiling on your underwater base so that he water didn't fall down? Anyways, I really am impressed by your work, some seems abit... off though, but that's another matter. I see a lot of creativity in your work as a builder. You take advantage of the loopholes and tricks to mold your creation which is very admirable. But on the 3rd, 4th, 5th from the last examples, I was hoping to see a finished example. To be blunt, I'm not a huge fan of 2-dimensional creations, it can be done easily and I'm sure anyone can do it. I would be really impressed if it was all you...well some of it. Judging from your application, I'm taking you want to make attractions to bring new players in which is pretty typical and cliche. But what I expect from you is for you to create things for you and you only. Build something that molds your creativity, paint your infrastructure with your mind and ideas. Helpers help people in anyway they can. Architects build, and build, and build, and sometimes help build, if asked to. I would very much like to see some of your work as an architect.